London Fashion Week never ceases to amaze and delight its stylish audiences. I’m always so excited to see what the designers are going to showcase. London is such a vibrant and cosmopolitan city which shines through the collections as there’s always a little something different. There’s an effervescence and youthful aspect to London, making it like no where else on earth. This year designers took no prisoners and collections were unashamedly bold and bright. Here are my top 11 street style trends from an amazing week spent at the shows in the City. Sneakers, or trainers as we like to call them, have made massive fashion waves across the industry. Some people have shunned the massive sneaker trend saying its too ugly. While others have totally embraced the ‘ugly trainer’. I’ve always been a fan of the sport luxe look as it perfectly mixes a smarter look with the ease of sportswear. Expect to pair your sneakers with anything from maxi skirts, trouser suits to mini dresses. I absolutely love this as an alternative to a trouser suit or skirt and shirt combo. Boiler suits are not something you see a lot of, so its a great addition to your wardrobe. I love how it’s super flattering and can be dressed up or down. I adore the powerful look of this red boiler suit, however by rolling up the sleeves and adding some white pumps it’ll give you a totally different daytime casual look. It’s always fun to show a little skin and if you’ve been working out in the gym then why not show off your results! The transparency trend saw designers incorporate sheer coats, shirts and dresses. However try layering a sheer blouse over a detailed bralette or cami top if you’re not wanting to expose too much. If you’re not interested in sheer clothing, then Perspex bags were spotted at Brandon Maxwell. When it comes to choosing your boots for next season look no further than the Wild West! I love a pair of cowboy boots so I’m super pleased that it’s the next biggest footwear trend. Its great how these boots can add a playful twist on any outfit. We saw simple styles in the new Fendi collection. While the models at Dolce & Gabbana strutted down the catwalk in sequin versions. For extra fashion points, tap into two trends at once with some white cowboy boots! A little bit of embellishment always makes an outfit seems more special than others. I loved seeing embellishments and sequins making its way into the daytime collection at this years fashion week. Many designers showcased heavily sequinned garments for both day and night, so don’t be afraid to wear those sparkles! If full on sequin seems too much for you then just add little details of embellishments to nail this trend. One of the biggest accessory trend this season is the head scarf and I love it! It can really transform any outfit. What’s great about a head scarf is that there’s no one way to wear them. We saw Balenciaga models sporting chic head scarves on the runway and its always been a staple fashion accessory of the street styler. The string bag is a carefree and fun fashion trend. It makes me think of browsing round the artisan markets in the south of France. The mix and match print trend can seem alarming at first but by following some simple rules its can look super stylish. I think its best when one of the prints dominates and then the second can compliment it. It’s also important to keep the fabrics in the same colour family. I love having fun with fashion and this is a great way to experiment and enjoy trying something different. At the Rodarte the models were adorned with pretty flowers making for a very feminine show. 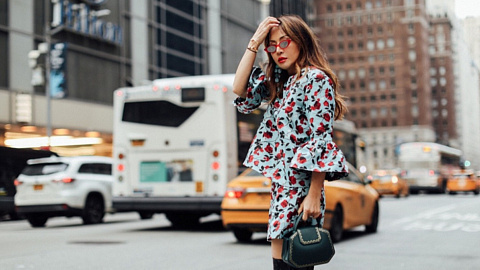 Expect to see lots of cute floral mini dresses for next season. There’s nothing nicer than when the warmer days start to come back and you can get those super sweet florals out of the wardrobe. However if you can wait that long then team your mini dress with tights and boots! Denim on denim is a look that constantly divides option in the fashion world. However love it or hate it, there was plenty of double denim gracing the catwalks this fashion week. I think if you style it right, this is actually a rather chic look. Team your denim with a crisp white shirt and you cant go far wrong. That’s because its important to create a contrast to break up the head to toe denim. For next season lighter denim will be everywhere, which is a great option for sunnier days. Tailored pieces are always the most flattering and make you feel so well put together. From the shows we saw designers moving towards a more structured and sharper silhouette. Burberry and Givenchy took on the androgynous styling with trouser suits and tailored coats. I love how a simple tailored coat gives you a polished and elegant look. It’s a simple trend but with powerful confidence boosting effects! One of my favourite trends for spring is the different types of exaggerated sleeves. There’s bell shaped, ultra long and oversized – and I love them all! We saw the grand at Celine, Lanvin and Proenza Schouler to name a few. I think they can really make a statement and are a lot fun to wear. The biggest the sleeve, the more fun you’ll have wearing this trend. We don’t always have the time or the inclination to be glammed up to the nines. So I’m always grateful when there’s a dressed down fashion trend such a pretty sports luxe. So expect to be wearing your pretty ditsy floral skirt with your comfiest trainers. This look is perfect for running about town, literally!